Tennessean columnist Joe Rexrode said he’d paint an anchor on his forehead if Vandy fired Bryce Drew. They did, so he did. "It was one of the dumbest lines I've ever written. Not because I was wrong...because it's a dumb line." There are two rules in life. Number one, a bet’s a bet. Number two, the internet never forgets. Tennessean columnist Joe Rexrode knows both rules well and followed them as promised this week. The Vanderbilt Commodores had a pretty rough college basketball season this year. In fact, they finished with their worst record since 1948. Yeah, that’s bad. So it’s no surprise that third-year head coach Bryce Drew was on the hot seat. That was especially true considering Vandy was 40–59 under Drew and seemed to be quickly fading as a program. Rexrode wasn’t convinced, however, that a change was coming. On March 13, he wrote a column discussing the potential firing and why it didn’t seem very likely. To Joe, Vanderbilt athletic director Malcolm Turner seemed unlikely to fire Drew after three years because he had just started his own tenure at the post and would want to avoid launching a massive coaching search so soon. Not to mention it probably meant that the Commodores would have to cough some decent buyout money to make the move. If Turner ignores all this and gives a lot of Vanderbilt fans instant gratification and makes a move, I will paint an anchor on my forehead. This is how confident I am that it won’t happen (and this is when you can easily dig up many other awful predictions of mine on the internet). And some fans were sure to take note of that paragraph just in case. 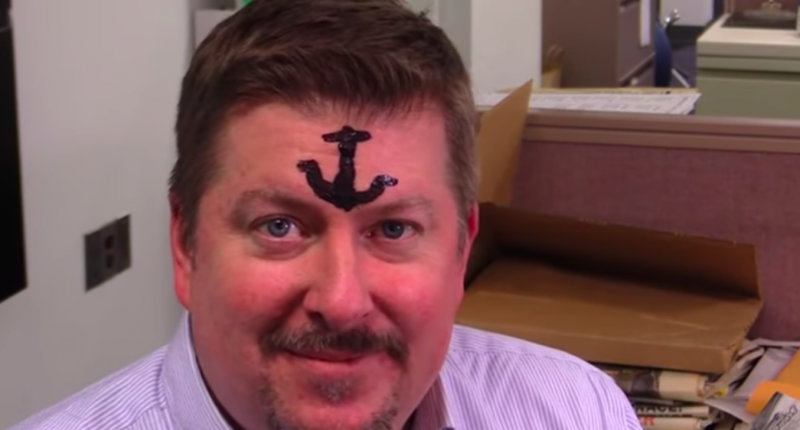 I notice how joe said he would paint an anchor on his forehead, didnt say he’d tattoo one. He’s not stupid. If it happens, wanna see photo evidence. Vols fans would forever use that photo as evidence of bias. Ha. On March 22, Vanderbilt fired Bryce Drew. You know what happens next. True to his word, Rexrode had an anchor painted on his face and posted video evidence for everyone to see. No word on how long the anchor remained on Rexrode’s face, though he should just be thankful he didn’t promise to get a tattoo.